I Lost My MotherBoard Driver CD/DVD ! What To Do ?? Whenever I install Windows I have to search for my motherboard CD for installing drivers of sound, LAN, graphics etc and majority of times it takes hell a lot of time to search for driver CD. At least I find it very difficult to keep my CD in a safe place so that I can use it when I need it. But what will you do if motherboard driver CD gets lost, I know you will say that you'll go to Internet and download all the desired drivers from there but for that you should know the model number also. If you have lost your motherboard CD and do not know your motherboard model number and want to download or update your drivers, here is a very good application for you. 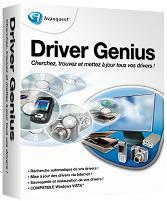 Driver Genius Professional manage your PC to get 100% up to date Drivers and optimize PC performance. Driver Genius Professional is a powerful driver manager for Windows that can backup, restore ,search and update your drivers automatically in several mouse clicks! Yes, you can backup all your installed drivers and can restore it back when needed. Without going to any website you can easily download and install required drivers. Isn't this a useful application !! * Quickly backup device drivers for your computer. * Backup your drivers to a ZIP or EXE self-extracting file. * Clone your drivers to an auto-setup package. * Wizard mode allow you step by step backup or restore your drivers. * Get detailed information about your installed devices. * Search for drivers for non-Internet connected computer. * Easy to get the most recent drivers for your computer. * Search all available drivers update by one click. * Live update your drivers information database online. It works on the following Operating Systems : Windows 98/98SE /ME/2000/XP/2003/Vista/XP x64/Server 2003 x64/Vista x64. This is a must have application and visit their official website to download this application. How to send content summary only for my feedburner subscribers via email?